Our wash-up blades are manufactured to fit perfectly on old and new presses alike. They are resistant to chemical attack from inks and solvents and are highly efficient and durable. Excellent wash-up results reduce the amount of wash-up chemicals needed and press down-time. Available for the majority of offset sheet-fed, web and continuous form presses in either metal/rubber or plastic format. Each blade is packaged in a plastic sleeve with the machine reference for easy identification. • Moulded rubber tip chemically bonded - no breakdown. • Size and style specification guaranteed. • Accurate fit first time - no adjustment required. • Chemical resistant rubber and plastic. • Individually packaged in protective sleeve. Requires regular replacement tonsure quality printing. 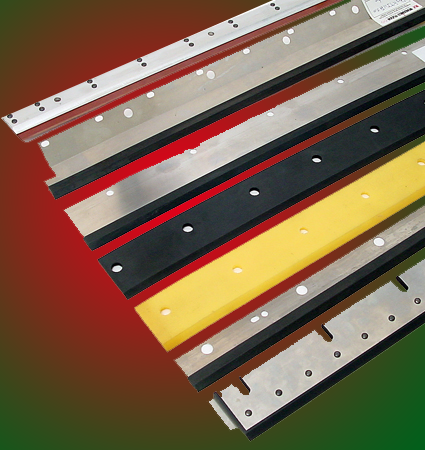 Flexible production allows us to produce special sizes and materials at competitive prices.